My Experience with and Thoughts on My First VR Demo. If there was a buzzword (or buzz-initials, in this case) to describe Sony’s E3 press conference this year, it’d be VR. Playstation appears to be going all in to this new tech, with Sony making its own headset to compete with the Oculus Rift, HTC Vive, and whatever else is out there. Sony’s even going so far as to redesign the PS4 (which is not lagging at all in hardware sales) to be more powerful, and thus more capable with the upcoming tech. With teasers for a Batman: Arkham VR title, a Star Wars Battlefront X-wing fighter VR mission, and even… something for Final Fantasy 15, Sony is definitely bringing the heat for their investment. But while most people where impressed for the Sony E3 conference, I can’t help but just feel somewhat unfulfilled by it. Aside from VR demos and promises, and teasers for multiple games that won’t even come out this year, a cautious attitude has planted itself firmly in my head. This isn’t because of my unenthusiastic attitude towards Sony itself, but it’s because I’ve seen this road before, and I know where it goes if companies and consumers aren’t too careful. Nintendo’s Wii and Wii U systems. Microsoft’s Kinect peripherals. In fact, MS’s past experiences with motion control based gaming being The Next Big Thing is probably why they’re being equally cautious and sticking instead to Augmented Reality (as seen with their Hololens device), and letting others pave the road ahead instead, while forming partnerships with said pioneers by including an Xbox One controller with the Oculus Rift, and currently having a deal with HTC to showcase and sell their Vive headset. I bring up HTC because at a Microsoft store in downtown Portland, I finally got my hands on a HTC Vive and took part in a tech demo. Equal parts eye opening and justification of my hesitation towards VR, it’s an experience I’m ultimately glad for. The second demo is where I started to actually play with the three dimensional space: 3D painting. If I was actually more artistic (I’m a film major and part time writer, not a painter) this would probably have been more fun, but after a few minutes I’d exhausted the limits of my creativity. Painting a smiley face on a virtual moon the size of a basketball… that’s about all I’ve got. The last demo though is when things got really fun: a virtual shooting range. And this wasn’t like a carnival attraction with a rotating line of targets, this was a sci-fi landscape with small flying robotic drones that would shoot back at you. This is where those two controllers I mentioned earlier truly came into their own: they could either act as your guns (dual wielding, WITH semi or full auto settings), or you could swap either one of them for a shield. Perhaps I shouldn’t be surprised that it’d be a first person shooter that’d impress me the most, and while it’s nowhere near as phenomenal as this year’s DOOM for instance in terms of gameplay, it felt fantastic here. The motion tracking was just about perfect so I could fluidly and quickly see all my surroundings when I needed to, and the rumble effects from the controllers were damn good too. They let you knew when you take hits, they have great feedback for when you’re shooting, and when they’re shields the rumble even matches up to when you deflect bullets. I wish I could adjust the gameplay so that the headphones could act as virtual ears so that you could hear the drones around you (especially when you can’t directly see them), and I’m pretty certain “active stereo” would be a great feature for VR gaming. After getting what I was told was a respectable score in the shooting range, the demo was over. The guy at the store took all the gear off, ask how I liked it (I thought it was really, truly cool), and showed me the cost of a Vive. 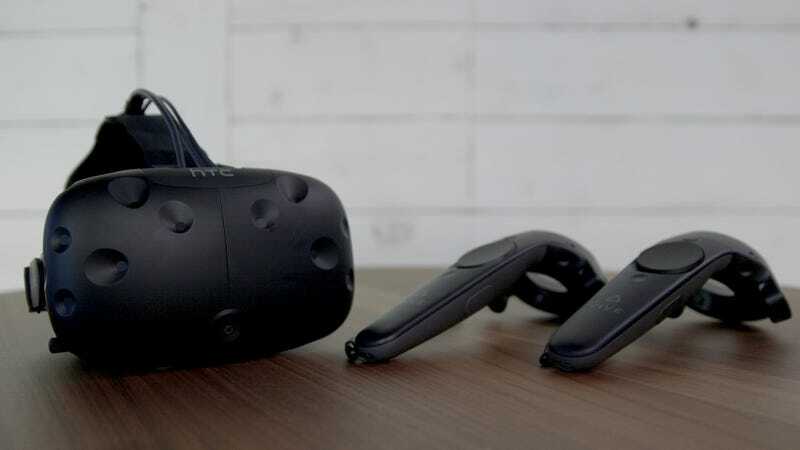 This is where VR’s main issue comes in: an HTC Vive retails at $800. That’s twice the price of Playstation VR, which itself is more expensive than an entire PS4. I know that there are people out there with more money than sense disposable income and loads of free time, but even so this is a mountain to climb in terms of affordability. And this all before we consider the increased costs of the PS Neo and Project Scorpio (on that note: Microsoft, please name this console Xbox Infinity. It’s still a great name!). Again, this is where I’m going to let the pioneers forge on ahead, and when the tech does find more use and increased production the price will probably start coming down, and then it won’t seem like such a bad purchase for a toy. Also by then the visibility and set up issues I faced might be sorted out as well. If I were a VR hardware designer I’d make a headset with a display that’s partially turned on when you put it on, and when you’re fully wearing it there’d be a button to turn it 100% on, and completely block out your outside vision (and by the same stroke, it could be turned back off to easily see what’s going on outside). Of course what I’m talking about is years away, and would jack the price back up, but if the F-35 helmet system is doing something similar, then it can’t be totally impossible, right? Right…? However, this is where my other main concern comes in: the implementation. All the demos I played today were all cool to a degree, but not one of them was something I can’t live without. There isn’t exactly a killer app here yet for VR, and when the initial thrill of these demonstrations wears out as it always does, will there be something there to keep people in? This is exactly what happened to the Wii after motion controls lost their luster and everyone realized the console wasn’t powerful enough to keep on going by itself, and the Kinect faced the same fate even after the Xbox One started to get a couple of truly good games for the peripheral (I will defend Fantasia: Music Evolved until the day I die, it is that good). As always it will be the games that make or break VR. I do now think that virtual reality does have something here, and it is pretty cool. Now though it needs something that’s truly groundbreaking to prove why it’s truly The Next Big Thing.